IOS App Developer: Dashing Dish, Inc.
Dashing Dish is a place where you can find not only wholesome and simple recipes, but encouragement, tools, and motivation for your journey to get healthy and fit for life. We are on a mission to get people off the dieting crazy cycle! I am a firm believer that living a healthy lifestyle can and should allow you to enjoy the foods you enjoy on a daily basis and never feel deprived. We have made it our goal to revolutionize peoples opinion of planning, preparing, and enjoying healthy meals. The Dashing Dish app features: 800 + RECIPES: We have over 400 free recipes and 415 membership recipes (updated weekly) listed on Dashing Dish. Every recipe is made with healthy, wholesome ingredients without losing any of the flavor. Most of the recipes on Dashing Dish are 'clean eating', which means they are made with 100% whole ingredients and do not contain any flour, sugar, or processed ingredients. 80 + WORKOUTS: We have over 80 workouts (updated weekly), some of which are membership workouts, such as bootcamps and month long series. In addition to nourishing your body and soul, I also hope to equip you with practical knowledge on getting physically fit, which is where Dashing Workouts comes in! The workouts section of Dashing Dish features a variety of workouts that can be performed by people of every fitness level. You will also find a balance between gym workouts, and home workouts that use little to no equipment. MEAL PLAN BUILDER: Our brand-new meal plan builder takes all the guesswork out of planning and preparing meals. With this custom tool, you can search for recipes based on ingredients you have on hand, or add them from your favorites section on Dashing Dish. This feature also allows you to search and add recipes from other websites, as well your personal custom entries. 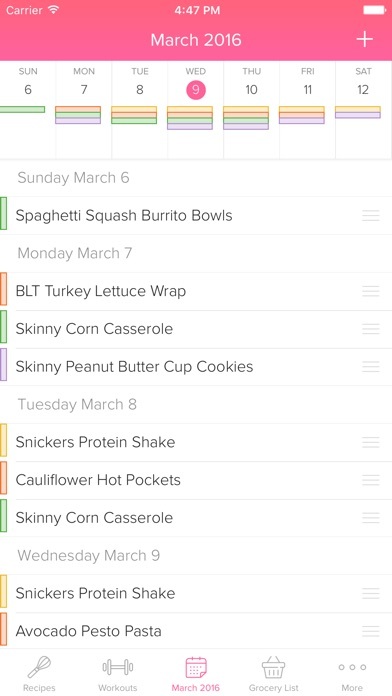 You can now plan your meals up to two weeks in advance in a matter of minutes. 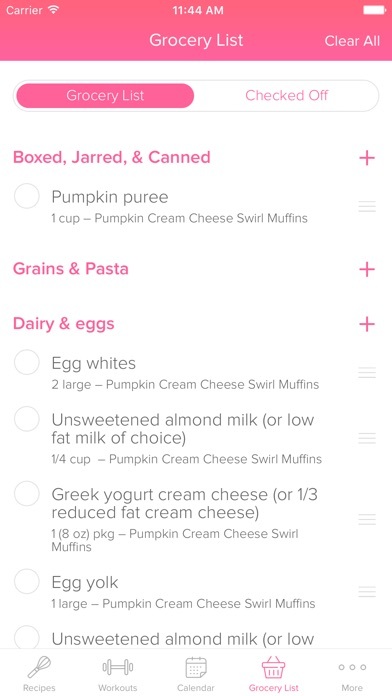 GROCERY LIST BUILDER: We've made it easy to plan and shop for your meals with the Dashing Dish grocery list builder! Instantly create a grocery list from the meals on your calendar, or build your own list based on recipes you are making & ingredients that you need. Now you can be sure to come home from the grocery store with everything you need, and that nothing will be wasted! ———— Here at Dashing Dish, I desire to empower each and every person who visits with the resources, tools, and encouragement needed to live a healthy and balanced lifestyle that is enjoyable and maintainable long term! My family of four is so thankful for Dashing Dish. Super easy to prepare, delicious and family friendly. I love the ease of the app and its ability to help keep you organized. From saving your favorite recipes to creating your grocery list. It’s a must have and a family game changer for sure!! All mamas need these recipes!! Dashing Dish recipes are a staple in our home. I’m a wife and mama to two very young boys, 1 & 3 yrs. I’ve been following Katie on all social media platforms and using her recipes almost daily since fall of 2012! The app is an incredible tool and so easy to use not to mention beautiful fonts and designs. The calendar and grocery lists are super easy to use and so helpful when meal planning. You won’t be disappointed!! This app is so user-friendly, helpful and makes life so easy! The recipes are simple to make and require basic ingredients! I love the meal planning calendar! The recipes are healthy and easy to search and mark as a “favorite” so you are able to easily find it and make it time and time again! Review of Dashing Dish APP, not website! Katie and her team are changing the way we think about food, exercise, and prioritizing the way we “should” be with the way God wants us to be. I’ve been a fan for years and will continue my paying membership until no longer available! That being said, the app is only adequate and doesn’t reflect the refined, user-friendly abilities of DashingDish.com. Making changes to the menu calendar is impossible. Repeat items (ex. bacon) appear multiple times if used for multiple meals instead of consolidating and increasing quantity. Workouts are easy to access but not formatted for a small screen like a phone. The above mentioned items are annoying and make the DD.com experience less than stellar. This being said, I will continue being a paying customer and use the app as a supplement for my normal browser use. Make it compatible with my IPad! I am really enjoying the app especially when grocery shopping and need to remember the items I need to pick up. Very easy to navigate through. Okay, so I absolutely LOVE Dashing Dish! I’ve been a member for years and have made so many delicious recipes from the site! Even my husband, who doesn’t “eat healthy” has enjoyed many of these meals! The app, although convenient to have on my phone and not have to go to the website, has some flaws! 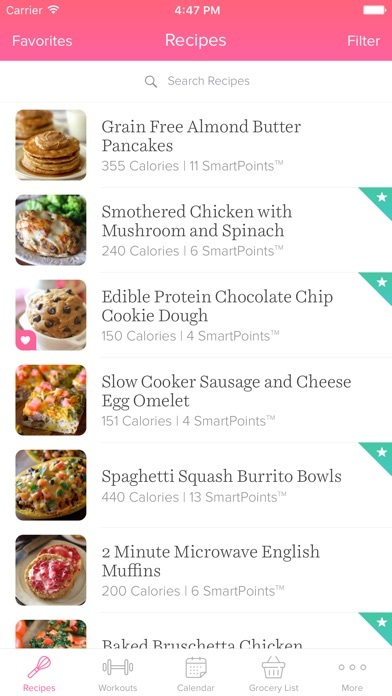 I use the app to meal plan and I’ve found recently that it is impossible to delete a recipe once it is on a certain day! 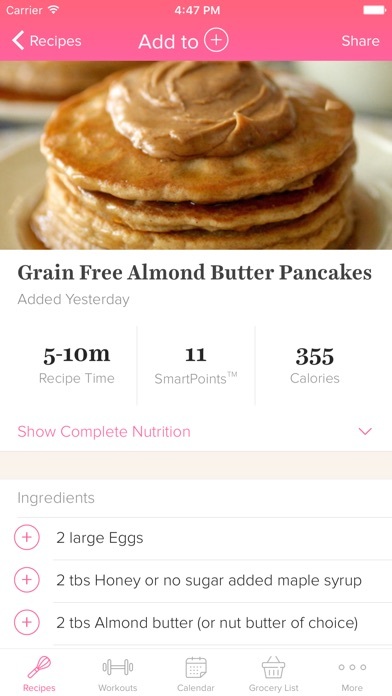 When you swipe the recipe to the left, a little delete button pops up, but when you hit it, it disappears and the recipe is still there! Am I doing this wrong? It is driving me nuts because I am trying to plan out my weeks, but even after trying to move things around, I can’t get my week to look like I want! Also, I have yet (after probably a year, maybe two) of using the app, been able to save a favorite! Every time I go up to the “add” button and click favorite, it says there was an error! I have no favorites in my acct anymore even though I had dozens saved long ago! Again, don’t get me wrong here.. I absolute love Dashing Dish and all these amazing recipes, but I think the app needs some adjusting!! Did the read the title of this review? I cannot say much more than that! I love this app, and Katie and the dashing dish crew! The recipes are amazing! My husband loves them! And my mother in law has even asked for recipes! (And that is saying a lot!) thank you dashing dish! I love these recipes and the calendar/grocery list features on this app. So helpful for meal planning! More IOS Apps by Dashing Dish, Inc.